our sole focus is YOU. At Scout Financial Group, our sole focus is YOU. Scout Financial Group provides investors custom-tailored strategies to meet short- and long-term needs. Our goal at Scout Financial Group is to help our clients realize their financial dreams by offering creative solutions through an open and transparent process utilizing innovative solutions to achieve financial independence. Learn how to prepare for a steady retirement. How can you maximize your Social Security benefits? Thought our strategic alliance, we can help optimize your tax strategy. We work hard to help you choose the right retirement path. At Scout Financial Group we believe in an educational approach, and are here for you. Scout Financial Group serves Shawnee, KS and surrounding communities. Our mission is to provide the families and businesses we serve with innovative financial strategies, solutions and planning that result in financial clarity, security and overall financial health. Making strong commitments to our clients and building lifelong relationships are tenets of success at Scout Financial Group. Take your first step on the road to retirement. The Color of Money Risk Analysis assesses your financial picture and provides a roadmap to your overall risk preferences. The output will be a proprietary Color of Money score. You may also explore where you are on the risk spectrum, and you can choose to retake the Color of Money Risk Analysis to further understand how specific actions may affect your score. Access your important information 24/7. With the Generational Vault you will never waste your precious time on the ceremony of the safe deposit box again. Every time you log into the vault, you have immediate access to detailed financial information. You can view a snapshot of your financial picture, a simple-to-understand summary of all your financial accounts, detailed records of your assets, important financial reports and dynamic charts. Our firm takes pride in providing comprehensive retirement strategy services to our clients. We review our clients’ wills, estate plans/trusts, taxes and insurance. Our comprehensive services integrate all aspects of our clients’ financial picture in a coordinated effort to provide for financial clarity and multi-generational wealth. 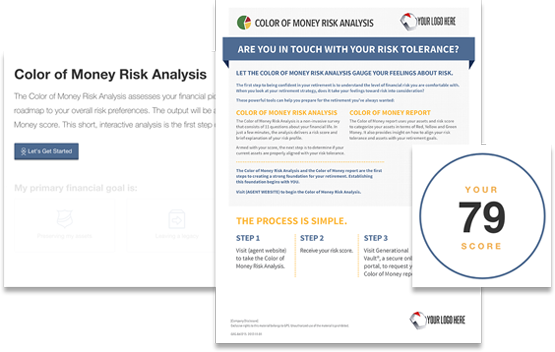 The Color of Money Risk Analysis was designed to help you better understand how your long-term goals should impact the financial decisions you make today. You can get your Color of Money Score by answering 11 simple questions. It’s the first step toward evaluating your finances using the most important criteria of all – your goals! Never again worry about forgetting where you put your trusts, wills, powers of attorney, insurance policy, investments and other critical documents because they can now all be kept in one place that is easily accessible! Contact us today to learn more how Generational Vault can help ensure that you are left with clarity instead of chaos. At Scout Financial Group we help our clients understand their Social Security benefits and educate them on how they can maximize their benefits. There is a lot to know about Social Security, and the more you know, the better decisions you can make, helping to bring you just that much closer to maximizing your benefit. We will help you get the most you can out of your benefit, so you can take one step closer towards the comfortable and happy retirement you have worked so hard for! Jason Smitka and Scout Financial Group are not affiliated with or endorsed by the Social Security Administration or any government agency. This content is for informational purposes only and should not be used to make any financial decisions. All written content on this site is for information purposes only. Opinions expressed herein are solely those of Scout Financial Group and our editorial staff. Material presented is believed to be from reliable sources; however, we make no representations as to its accuracy or completeness. All information and ideas should be discussed in detail with your individual financial professional prior to implementation. Insurance products and services are offered through Scout Financial Group. Scout Financial Group and Jason Smitka are not affiliated with or endorsed by the Social Security Administration or any other government agency. This content is for informational purposes only and should not be used to make any financial decisions. Exclusive rights to this material belong to GPS. Unauthorized use of the material is prohibited.